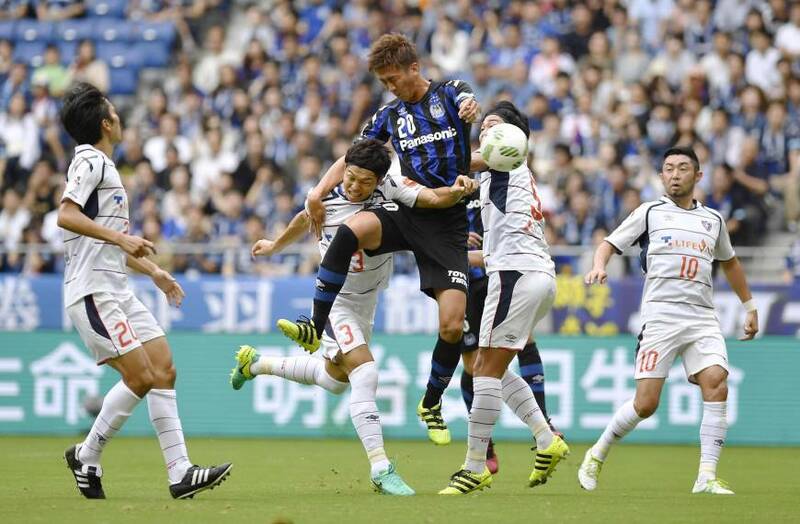 Kawasaki Frontale and Urawa Reds joined Kashima Antlers in clinching a place in the J. League Championship last Sunday, but this weekend’s action will go a long way toward deciding if any more teams join them. The top three teams in the overall league table and the winners of each stage qualify for the postseason playoffs, although the chances of those positions being occupied by five separate teams are slim. Frontale and Reds both guaranteed themselves top-three overall finishes with victories on Sunday, while Antlers locked up their berth in June by virtue of winning the first stage. That leaves just one qualifying spot available through overall league positions, although with Antlers also currently occupying third place, eight points ahead of Gamba Osaka with four games remaining, that ship appears to have sailed for the rest of the title hopefuls. If any other team is to qualify for the playoffs, then, they will likely have to win the second stage. Reds currently lead the way two points ahead of Frontale, with Gamba one point further back and Vissel Kobe and Kashiwa Reysol one more behind them. With Urawa playing Gamba, and Vissel and Frontale squaring off this weekend, however, the picture could change significantly. Vissel’s current overall league position of eighth would make them unlikely champions indeed, but the J. League’s two-stage system — still in place for this season at least — gives them a fighting chance. Momentum at this stage of the campaign is crucial, and with Gamba, Reysol and Vissel enjoying unbeaten runs of four, five and six games, respectively, anything could happen between now and the end of the season. The second-stage picture is about to become a lot clearer. 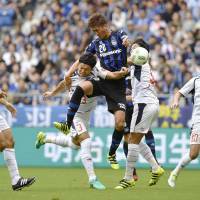 On the brink: The end appears to be drawing closer for Avispa Fukuoka and Shonan Bellmare. Both teams could be relegated this weekend if results fail to go their way, with Avispa bottom of the table on 19 points and Bellmare one point above them but still trailing fourth-from-bottom Albirex Niigata by seven points with four games remaining. “Today we really showed our strengths from start to finish,” said Bellmare manager Cho Kwi-jea after Sunday’s 0-0 draw with Jubilo Iwata, which stopped a run of 10 straight Shonan defeats. “We attacked quickly and with belief whenever we won the ball. We only got one point, and although it might be a stretch to say that this is a big response for us looking ahead, I do think it’s a step forward. Goal rush: The race for the first division’s top scorer is heating up, with a crowd of players closing in on Sanfrecce Hiroshima’s 18-goal leader Peter Utaka. Nigerian Utaka fluffed a chance to add to his tally when he missed a penalty during Sanfrecce’s 3-0 loss to Urawa Reds on Sunday, while Vissel Kobe striker Leandro moved onto 17 for the season with a goal in his team’s 4-1 win over Avispa Fukuoka. Kawasaki Frontale pair Yoshito Okubo and Yu Kobayashi are both one further back on 15, while Kashiwa Reysol’s Cristiano is still in contention with 14 goals. Kawasaki Frontale striker Yu Kobayashi reacts to his winning goal in the 100th minute of Frontale’s 3-2 victory over Yokohama F. Marinos on Sunday. Frontale were winning 2-0 until Marinos scored in the 96th and 98th minutes.